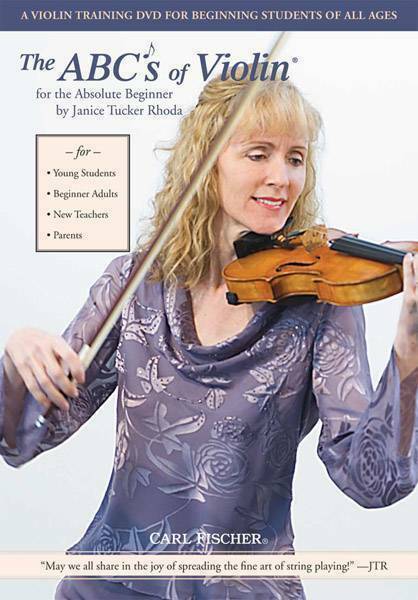 This DVD, featuring Janice Tucker Rhoda, is the perfect beginner’s approach to the Violin. It covers all the basic,essential points for the new player. This is a powerful supplement to the book, The ABCs of Violin for the Absolute Beginner, Book 1 and to the accompaniment/performance CD - ABC1CD. Highlights include instruction on finger positions, bowing techniques, basic music-note reading and play-along pieces such as Beethoven’s Ode to Joy, Twinkle, Twinkle Little Star, Arkansas Traveler, A Shakespeare Play and Home on the Range. This 60 minute instructional DVD is an excellent learning vehicle for those wishing to study the Violin.